Last we week we got to experience some of the best places to eat in Gulf Shores. We even visited a couple of these best restaurants Gulf Shores and Orange Beach have to offer twice during our trip. 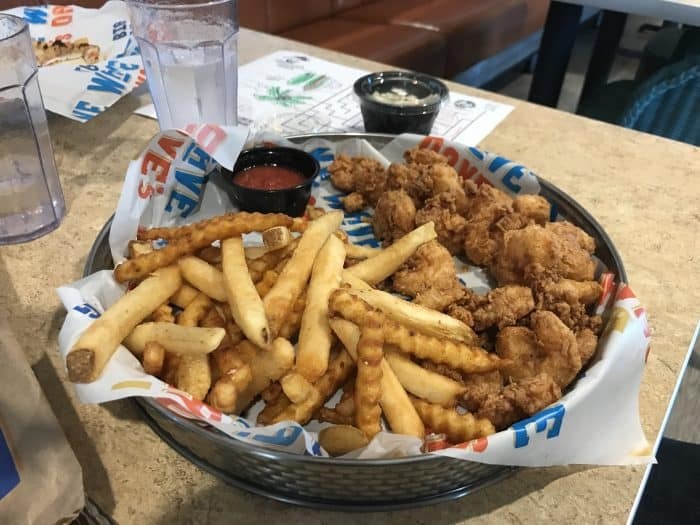 Whether we loved the food, location, atmosphere or all three, we recommend you check out these best Gulf Shores restaurants on your next Alabama Gulf Coast vacation. 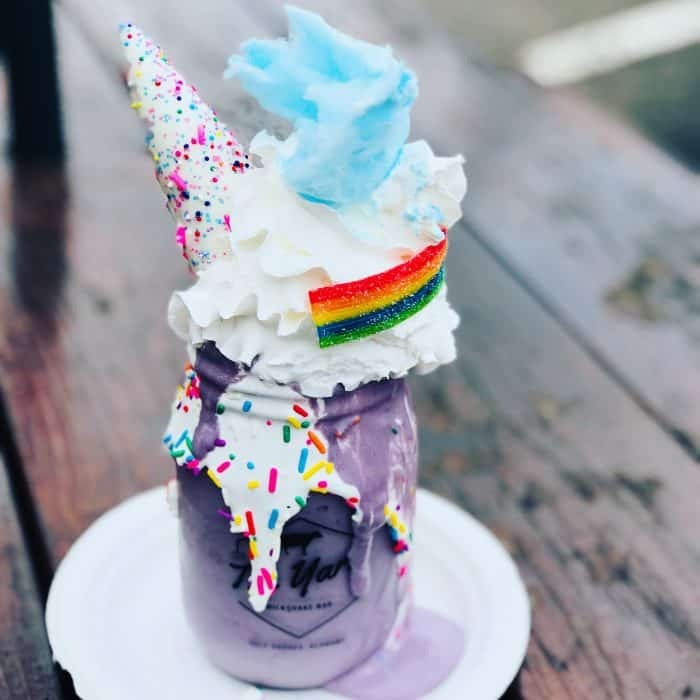 Bring your sweet tooth and get ready to experience the most indulgent milkshakes ever created. Don’t believe me? Check out “The Unicorn.” Sweet T was in heaven. I opted for the “Doughnut Touch My Coffees and Cream” and had to have a little help eating the doughnut. I mean look at it! Gus had the off-menu special “The Mad Hatter” just for the unicorn poop (cake balls) of course! 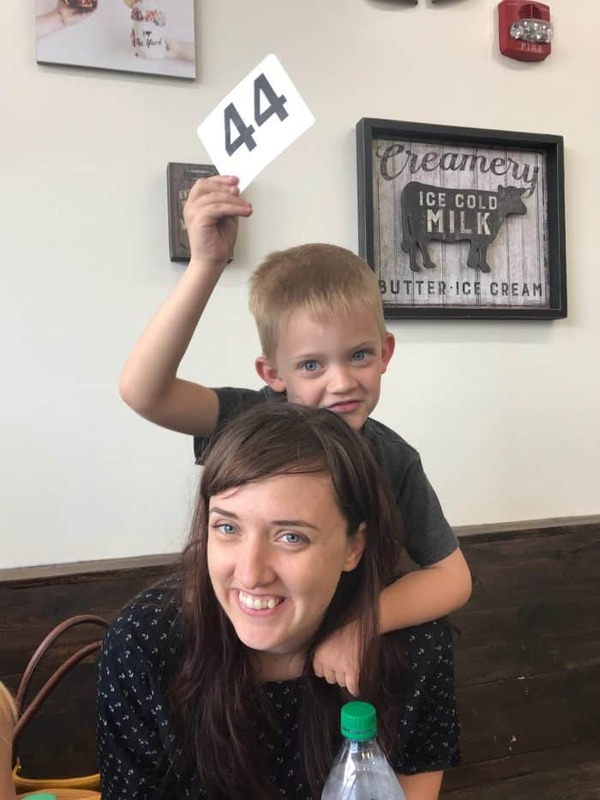 He thought waving our number around would help them make the milkshakes faster. The Yard opens at noon and you’ll want to be there when they do. It’s a popular place and the line can back up quickly, especially during peak season. 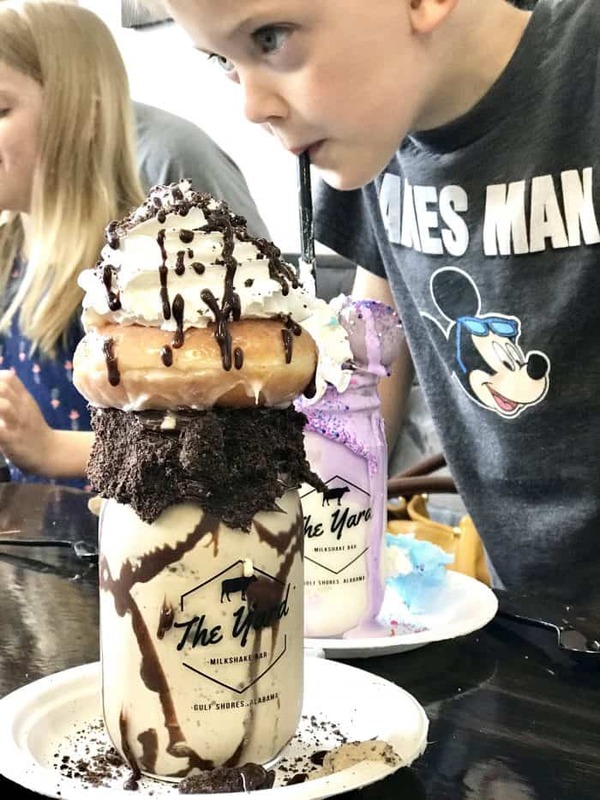 It’s among the best places to eat in Gulf Shores for satisfying your sweet tooth. 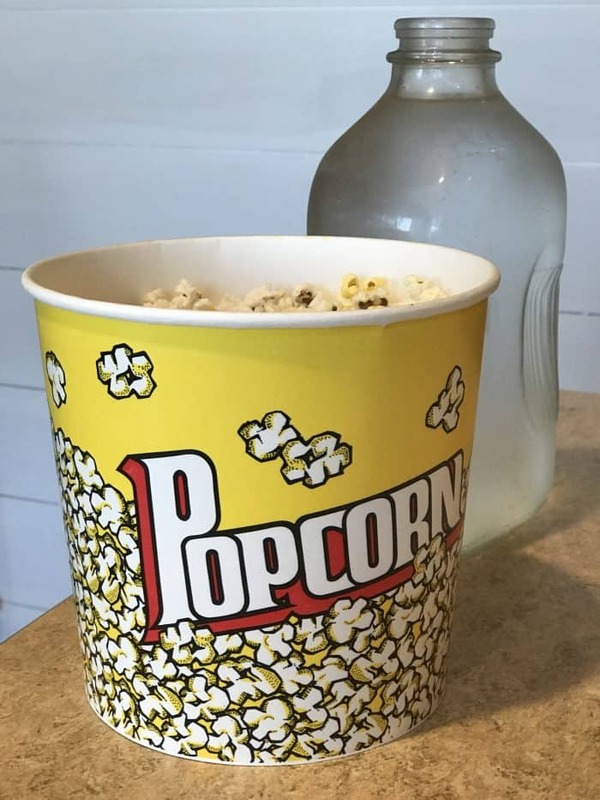 Once you’re seated at Big Wave Dave’s, a tub of popcorn is brought to your table. This was right up Gus’ alley. They won him over for the favorite restaurant of the trip for the popcorn alone. The live music and cheese pizza just sweetened the pot. I had the Hong Kong Tacos which were just the right blend of spicy and sweet, and Hubs enjoyed the Gulf Fried Shrimp. Sweet T…colored. Kids, man. 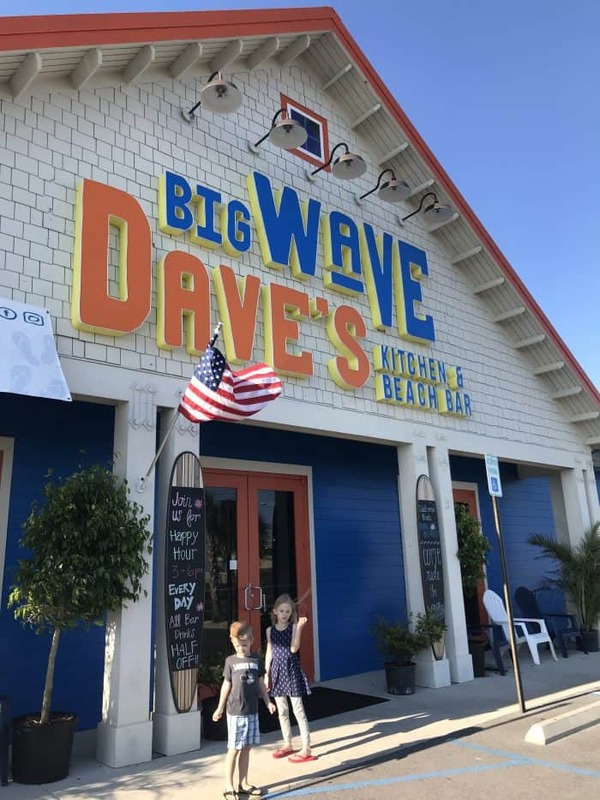 Hubs wound up bringing the kids back to Big Wave Dave’s a second time while I was finishing up my Scuba certification. This was easily one of the best restaurants Gulf Shores and Orange Beach has to offer as far as they are concerned! You can walk to COASTAL after your adventure at Alabama Gulf Coast Zoo and just might see zoo staff there. You know it’s one of the best places to eat in Gulf Shores when you see locals there. We started off with the COASTAL Tomatoes with every intention of taking a few of them to go. That didn’t happen since they were just too tasty. 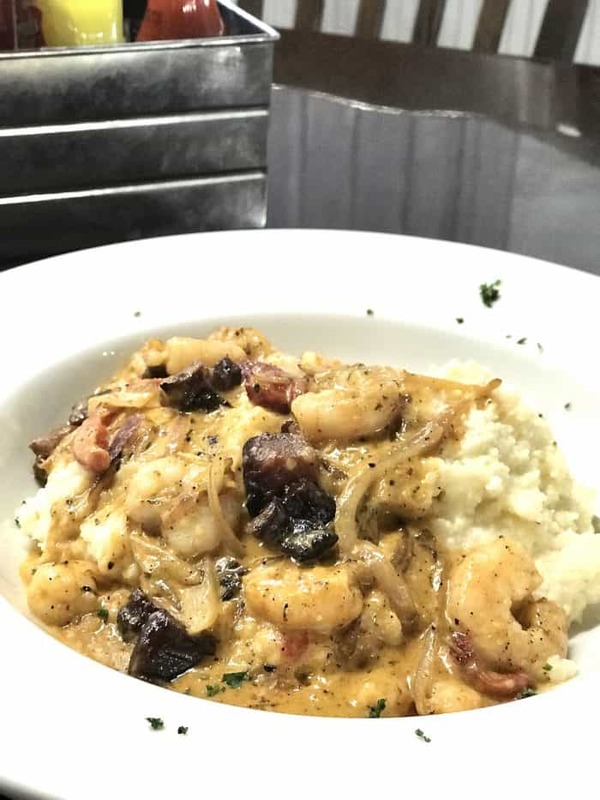 Chef Chris Sherrill studied in Charleston so you know he makes some mean shrimp and grits! Hubs declared them the best he’s eaten to date which is high praise coming from a connoisseur. I think the applewood bacon absolutely MADE this dish. My medium rare tuna was cooked just right and I even polished off the squash which is unusual for me. 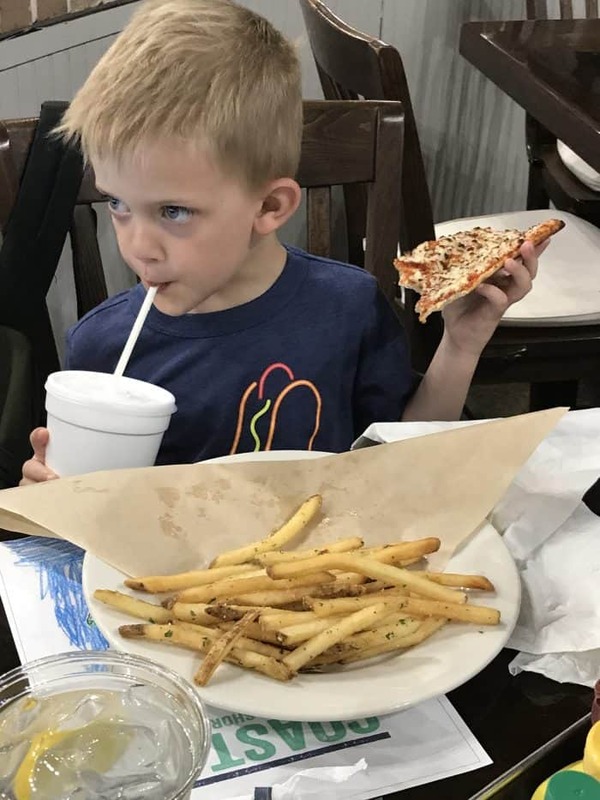 I’ll let Gus’ expression speak for the kid’s menu! 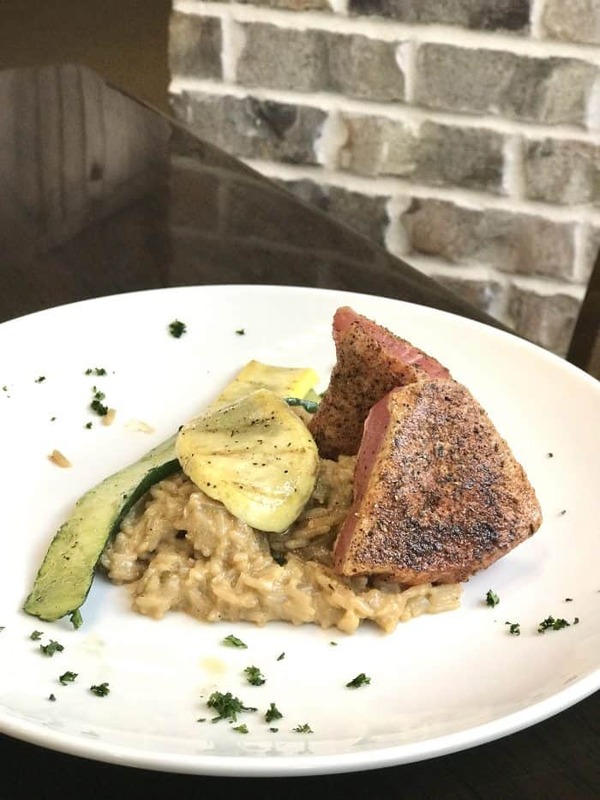 Be sure to follow COASTAL on Facebook as they often add things to the menu, create specials, and feature all sorts of live musical performances. Picnic Beach had been open for less than two weeks when we visited. Word is going to travel fast though so be prepared for a crowd when you plan your visit. 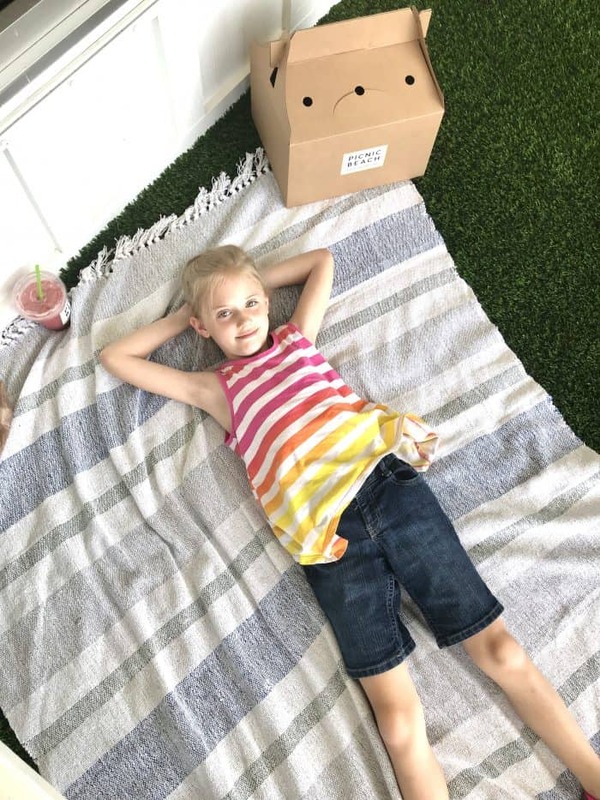 You’ll love the (health department approved) AstroTurf that you can picnic on if you choose! Or be like us and eat on a picnic table and create a spread for the kids to lounge on while you enjoy your meal in peace. Hubs declared the ribs at Picnic Beach the best he’s ever put in his mouth, then proceeded to fanboy over the pitmaster. I’d be jealous, but they are that good! 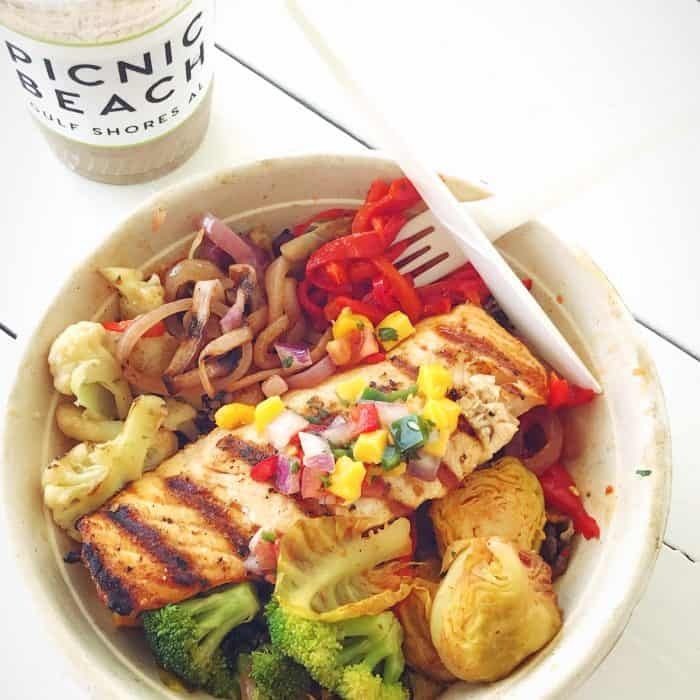 In addition to delicious smoked meats served picnic style, Picnic Beach is host to a bevy of health-conscious menu items as well. 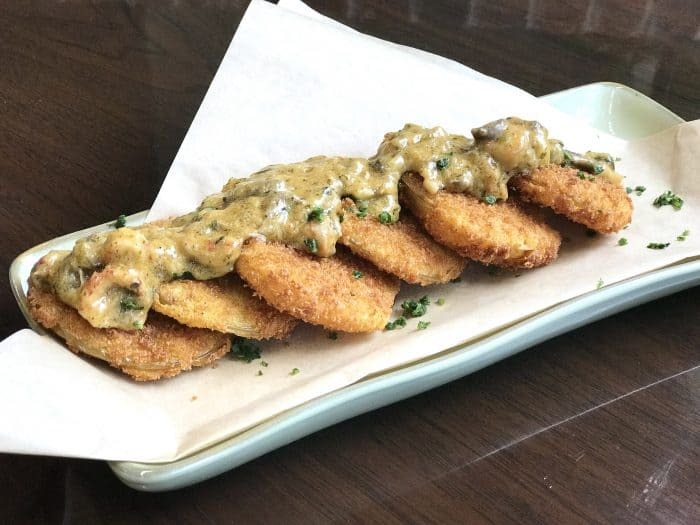 If you’re vegan, gluten-free, or paleo, it’s one of the best Gulf Shores restaurants for you. There’s so much on the menu that Hubs could have which was refreshing. 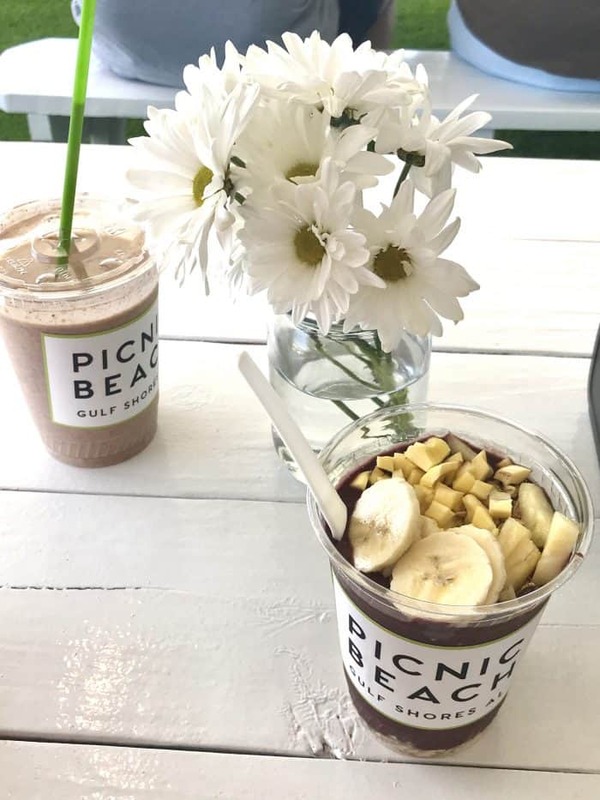 I had an acai bowl and the Beach Bowl while the kids enjoyed smoothies on their picnic blanket. As one of best places to eat in Gulf Shores for BBQ, we returned a second time and brought Hubs’ parents during their quick visit with us. Can you guess what Hubs ordered? More ribs! I branched out a little and tried the brisket bowl and a cold-pressed juice. 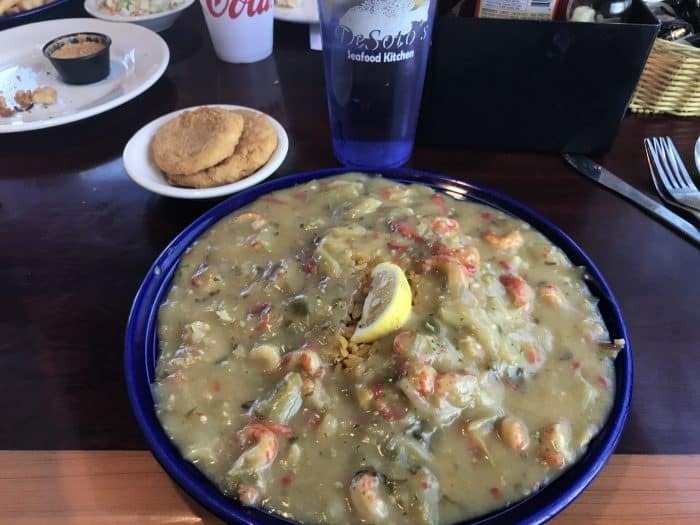 No list of best Gulf Shores restaurants would be complete without including De Soto’s Seafood Kitchen. 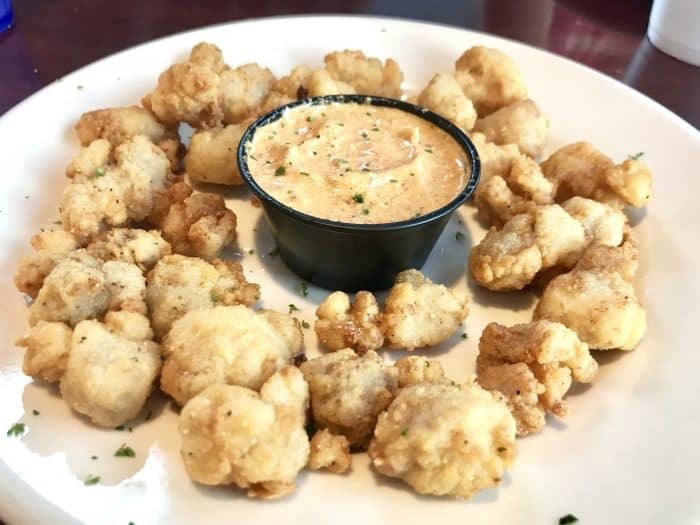 De Soto’s serves up the traditional, Southern seafood you’ve just got to eat at some point during your Gulf Shores vacation. In addition to frying just about anything to perfection (including gator tails! ), there are fresh oysters on the half shell and a variety of Cajun favorites. I had the crawfish étouffée and Hubs enjoyed a personal favorite: butterfly fried shrimp. De Soto’s is laid back and family-friendly so don’t hesitate to bring your little ones. Ours even found Nemo and Dory. 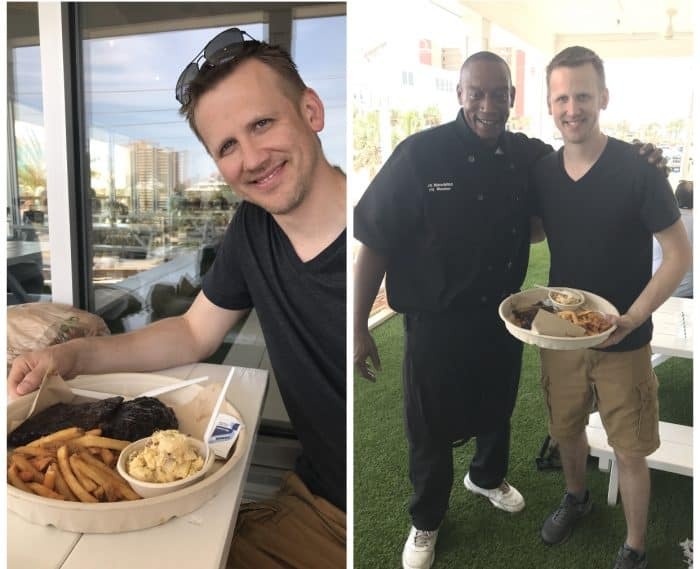 Blue Water BBQ Company is one of best restaurants Gulf Shores and Orange Beach have to offer for traditional barbeque. Served up cafeteria-style on butcher paper, their fare will have you coming back for seconds. 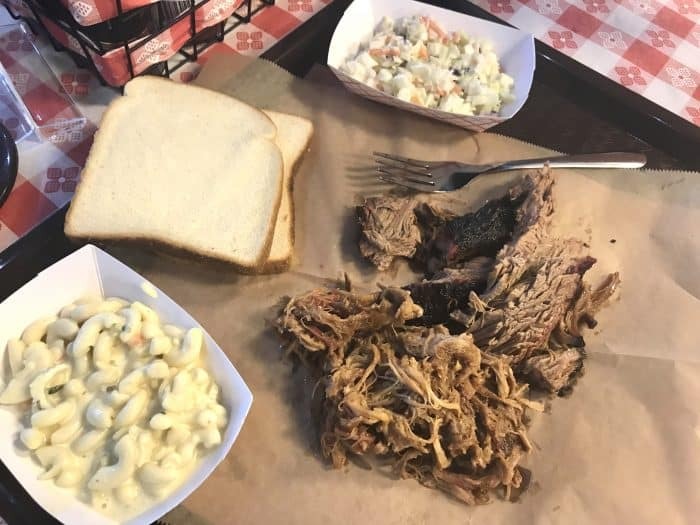 Take a peek at each of the meats before you decide what to order and watch them carve up the slow-smoked goodness right before your eyes. 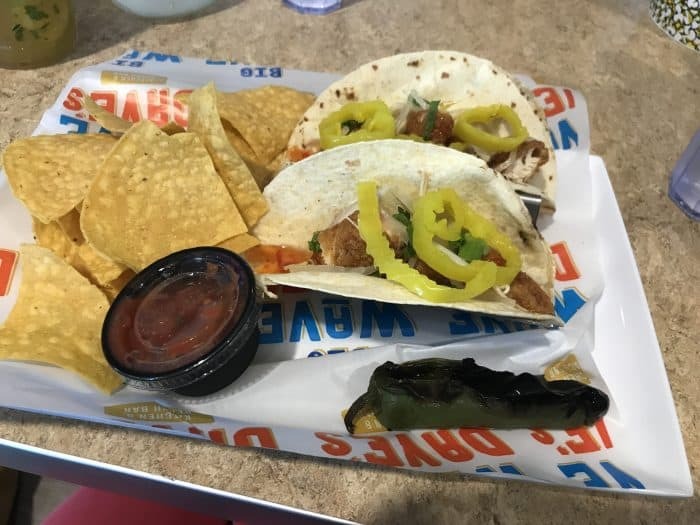 We were in a rush to get to my Scuba class when we ate at Blue Water BBQ and it worked out perfectly since the service it so fast. 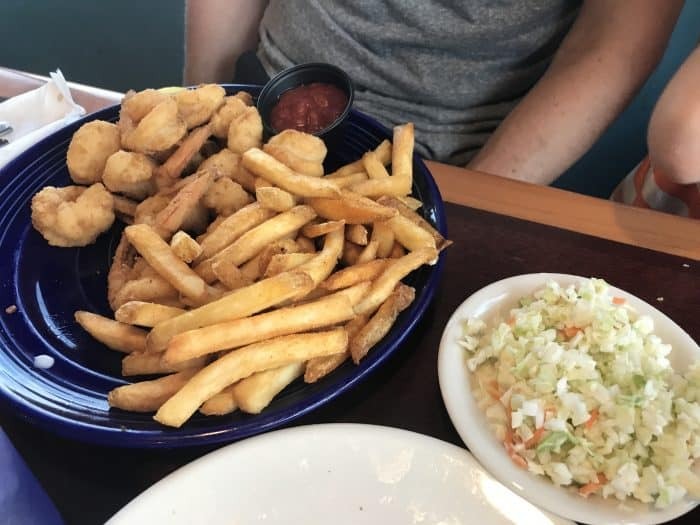 Blue Water BBQ is ridiculously kid-friendly from the PB&J and pizza on the menu for picky eaters like mine to the jukebox and quick service. Don’t miss it if you’re at The Wharf in Orange Beach. 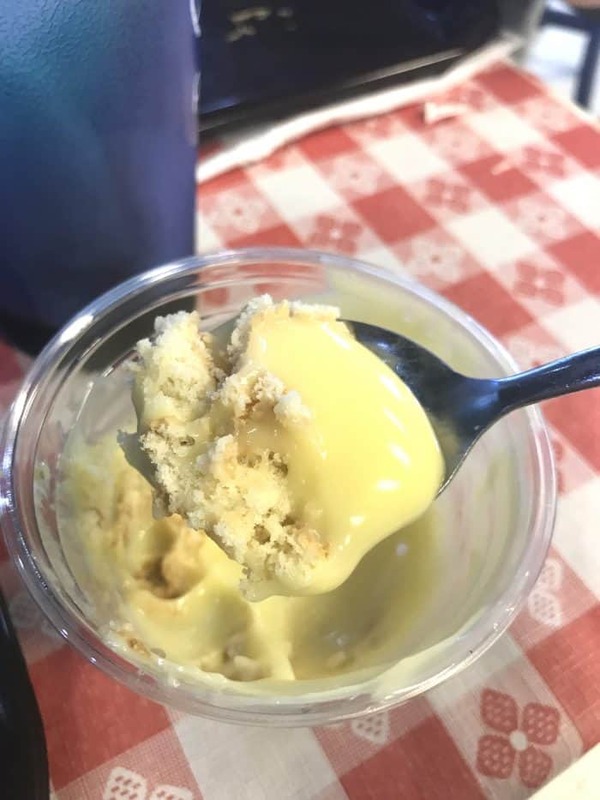 The $5 kids meals come with banana pudding for dessert that you can pilfer from your little ones if they are as picky as mine. Yum! These are just a few of the best places to eat in Gulf Shores and Orange Beach. Where will you go first?